To get started as a freelancer you need expertise, an impressive portfolio and a strong network. To maintain a stable freelancing career you need happy and returning clients. Clients are the key to your freelancing career flourishing or wilting. You need a good understanding of how to deal with your clients and you need to be aware that not all clients are the same. Some are understanding while others are not – you should have a strategy on how to deal with different clients and manage your projects. In this article, I’ll share 5 tips on how not to doom your freelancing career and how to ensure that it thrives and grows. When we start freelancing, we tend to accept all projects that come our way. Most of the time we don’t care whether we’ll be able to deliver a quality service, we often focus on the money. After all, money keeps the business (you) running. Accepting projects considering only the money factor won’t help you in the long run. Money is important but it should not be the deciding factor. Set yourself a limit and say no to projects when you are full – humbly refuse or postpone if you are at your limit. Often clients are not aware of what they want or how the project will come to life. If they were then they would be project managers instead of clients. Most of the time clients will have a vague idea of the end goal and they will keep adding new requirements and modifications throughout the project development phase. It’s our responsibility as freelancers to provide a well-presented estimate that outlines all of the features requested. 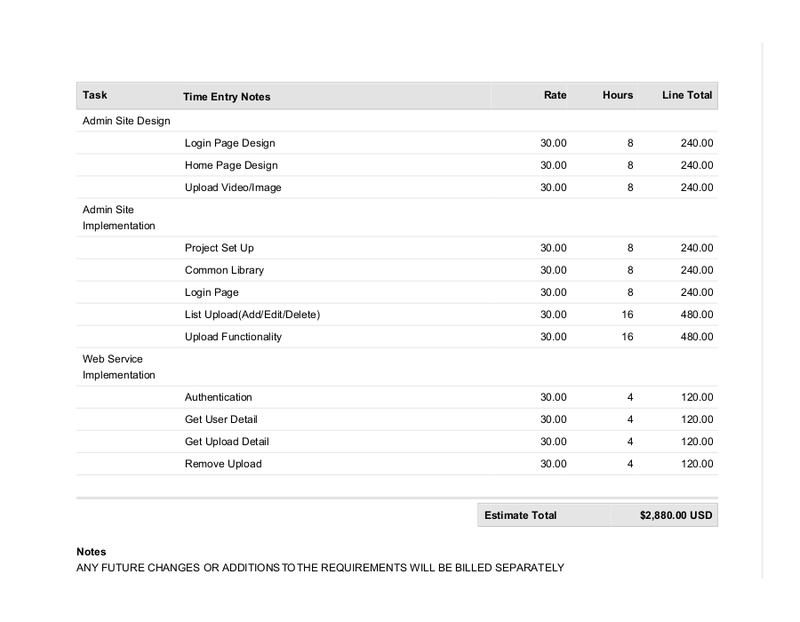 When you propose an estimate for a freelance project, it should be backed by a detailed breakdown of the work involved. Providing a detailed estimate will be more justifiable and acceptable than quoting a flat rate for a project. There are a few things to take into account when settling on a rate and providing estimates. Let’s consider a case where a client needs to develop a website. They are requesting a simple admin site for a mobile app where users can upload media that will be accessible from the mobile app. The client asks two freelancers for a quote. The first estimate, although quoted low, is loosely bound with all of the development work quoted in a single price. Such an estimate may give the impression that the price is inclusive of future changes and modifications. To avoid any confusion you should always provide a detailed estimate and mention that any future changes or additions in the requirements will be billed separately. Be sure to always clearly specify the items for which you are charging. Never settle for a rate that doesn’t fully compensate the effort that you will put into a project. Try not to settle for a low rate to secure a project from other freelancers. Try to focus on what you will do differently/better than other freelancers so that you don’t end up lowering the market rate. 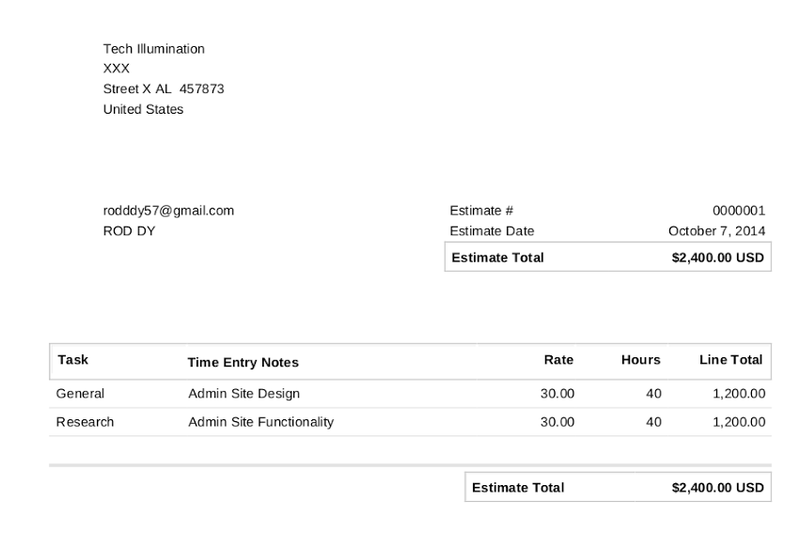 Always mention that any additional requirements outside the estimate will be billed separately. Clearly mention any assumptions that you are making regarding the project. Providing a detailed estimate helps ensure that the project and client management run smoothly. Without effective communication, the final product can, and often will, turn out to be very different from what the client had envisioned. Effective communication is an important part of freelancing – it is a skill that every freelancer must work on. Having good technical ability is useless if you are not able to communicate well with your clients. Over the few years of my freelancing career, I have met and dealt with a number of clients. Most of them prefer an average freelancer who can communicate well over a talented one who cannot. When you start a project, it’s very important to understand the needs of the client. What you read in a client brief may not be what they had envisioned in writing it. Make sure to ask questions and clarify each detail of the brief or of any other documents. Try to begin the project with no assumptions and if you do make some assumptions, make that clear with the client. Discuss every detail about the project and leave no assumptions. Create some visual mock-ups or prototypes to ensure that you are on the same page as the client. Avoid technical jargon and speak in a language that the client can understand. Avoid email conversations when discussing requirements as much as possible. Talk in person or organise a video call to discuss details and be sure, after the meeting to provide a summary of what you have discussed with accompanying visuals where necessary. Remain humble and reply promptly to any contact from your client. As I mentioned earlier, the final product can often turn out to be different to what the client had envisioned. A full rebuild can be avoided through effective communication along with providing milestone releases. If for example you are building an application, you can split the entire application into several modules. Each module can then be categorized under a different milestone. As each module is developed you can release it on an agreed-upon date to the client as a milestone. This way, suggestions and feedback from the client can be incorporated as you move along rather than all at the end of the project. When releasing your project through milestones the client gains an insight into how the project is shaping up. This way you can be assured that you’re on the right track. New freelancers tend to make promises that they sometimes cannot keep. There is no point promising to finish a project in one month if your client is happy to wait two. All of the tips that I have provided must work together and as such, effective communication is key to avoiding making poor promises and losing your client’s trust. All freelancers need to understand that trust is a strong foundation of any relationship. The positive relationship between a client and freelancer is heavily supported by trust. Be careful not to make promises simply to impress or to land a job, consider whether you’ll be able to achieve your promise in your current situation. Maintaining a stable freelancing business depends on a number of factors – having good technical ability is just the tip of the iceberg. To be a successful freelancer you need to know how to manage your clients, communicate effectively, manage projects and manage your time. If you have any questions or advice, please feel free to ask or share in the comments!